My daughter has been with me every time that I've voted since she was born. OK, one time she was technically she was with her daddy, but we vote as a family. Most of the time she gets my "I voted" paper...Here in Chicago we don't get cool stickers. We get pieces of paper that are receipts. Each time I talk to her about what we're doing. That we're voting for people who will make decisions about her school, recycling or the world in general. I've written before that I'm trying my best to explain this election to my daughter. We watched a few minutes of the debate together before she fell asleep. She always asks if "that guy/lady is rooting for Obama" when she sees someone talk about the election on TV. I'll be taking her to the polls again in less than a month. This time she'll know a bit more of why we're going. I know she'll ask me once she wakes up that Wednesday if we won. I just pray to the Goddess that her daddy & I don't have to disappoint her. Women’s Voices. 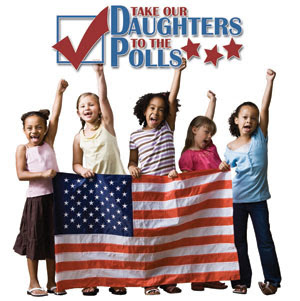 Women vote is proud to be a member of the Take Our Daughters to the Polls Coalition. WVWV and our partners are encouraging women across the United States to take a girl to the polls this Election Day. 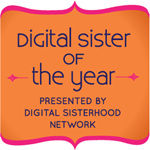 Show her that you believe in her power to make a difference. Take the pledge...I did! And "borrowed" daughters count too.